Meghan wore another eclectic mix of fashion brands for her afternoon in Wales with Prince Harry. 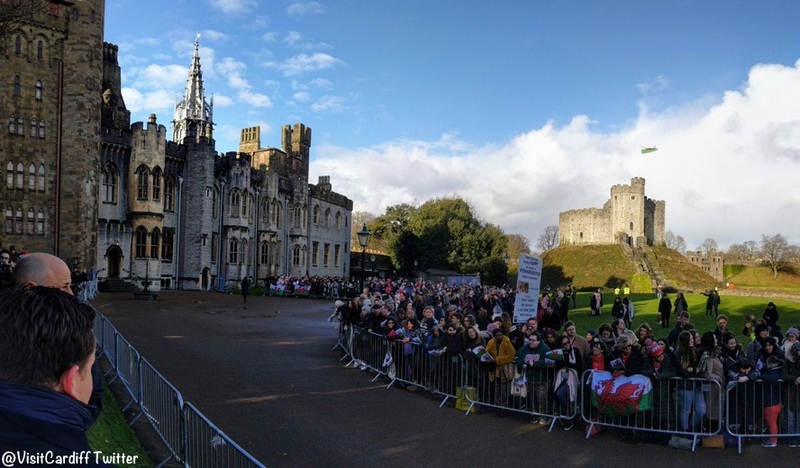 Their day of engagements in Cardiff, the capital of Wales, started at the historic Cardiff Castle. Located within beautiful parklands at the heart of the capital, Cardiff Castle’s walls and fairytale towers conceal 2,000 years of history. This is the couple’s third joint engagement, and their first appearance together in Wales. 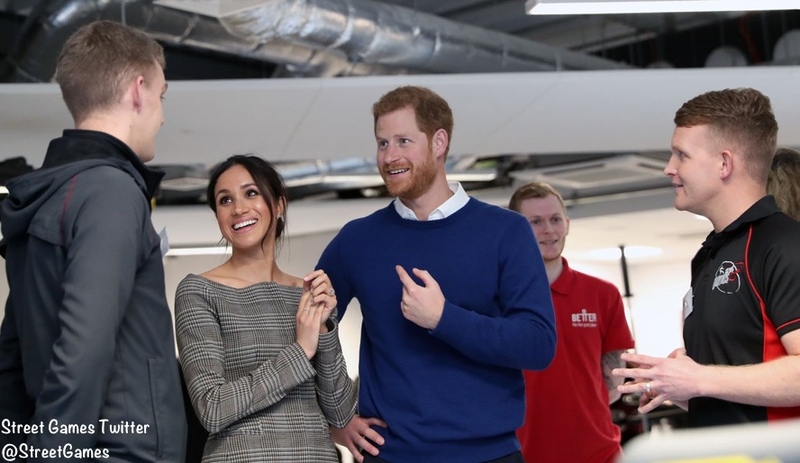 It reflects Meghan’s interest in learning more about the UK and its people as she continues to think about future charitable endeavors and interests ahead of this May’s wedding. Crowds started gathering early this morning to see the couple. A video of the walkabout. 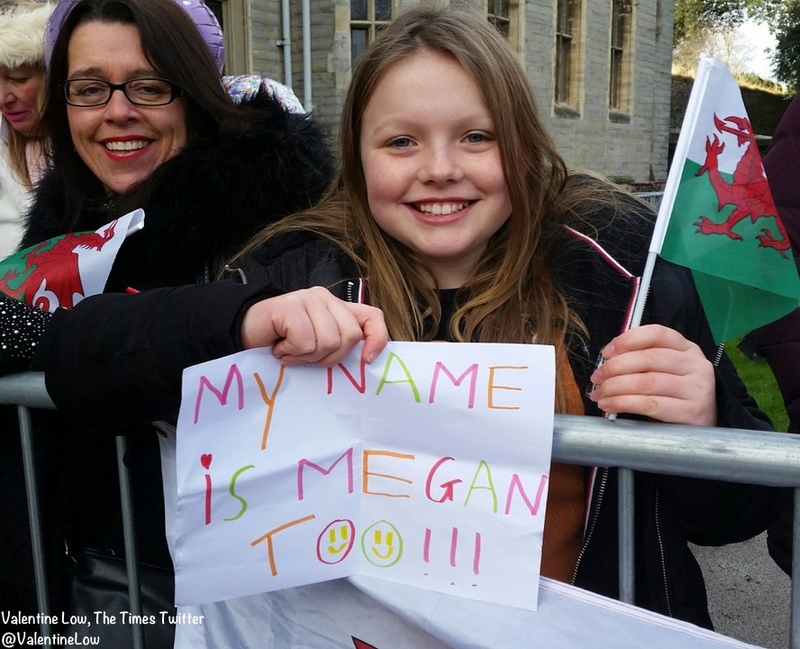 Megan McAuley, 10, held up a sign saying “My name is Megan too!” — and it worked. Her namesake spotted it and came dashing across the gravel path outside the castle door to say hello. 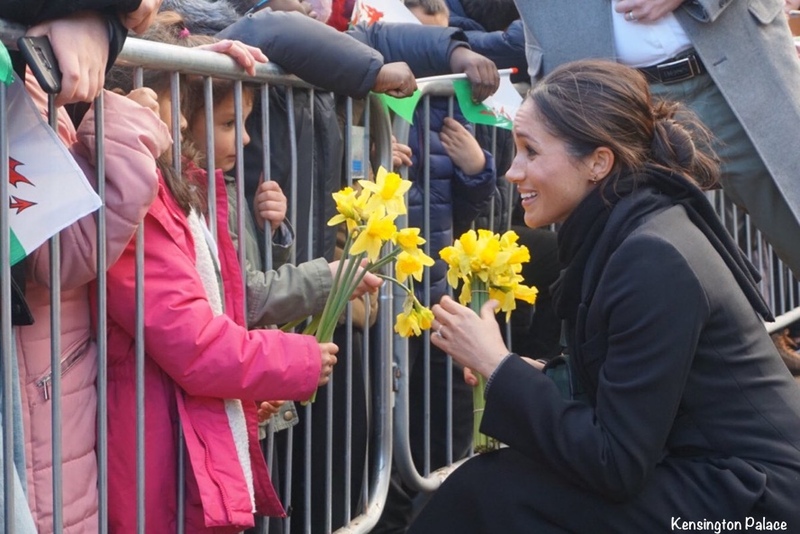 Meghan was given daffodils, the national flower of Wales. Self-confessed royal fanatic Cynthia Osborne presented Kate with a posy of daffodils, the national flower of Wales. Another view of the duo greeting people in the crowd comes via Simon Perry. 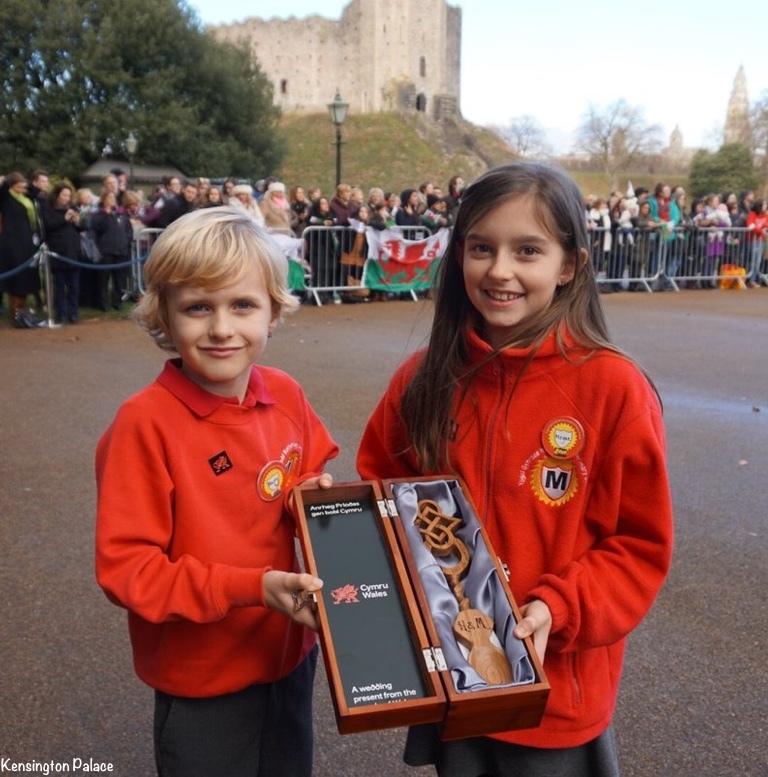 Two local children presented Harry and Meghan with a gift of a traditional Celtic love spoon. 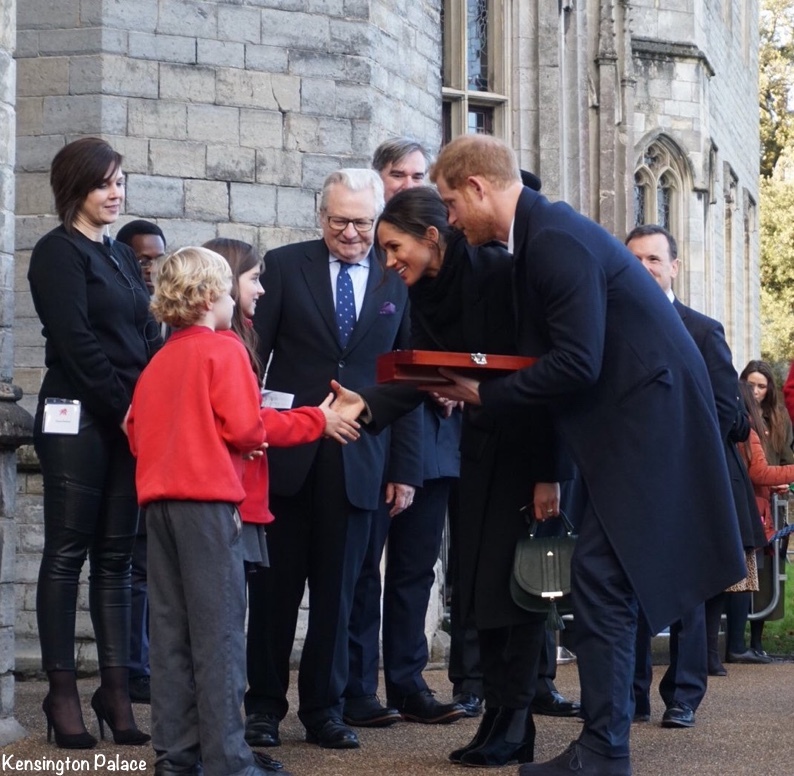 The spoon presented to Prince Harry and Meghan had H&M carved into the handle, the initials of the two schoolchildren and, of course, the married couple to be. The crafted wooden spoon features a Celtic knot, horseshoe and barley twist said to symbolise eternal love, good luck, and togetherness. The children’s names? 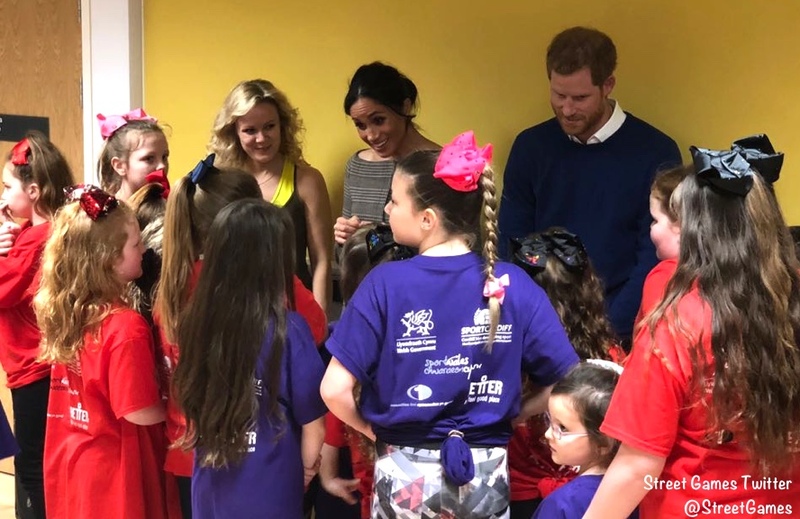 Harry and Megan; they both attend Marlborough Primary School in Cardiff. 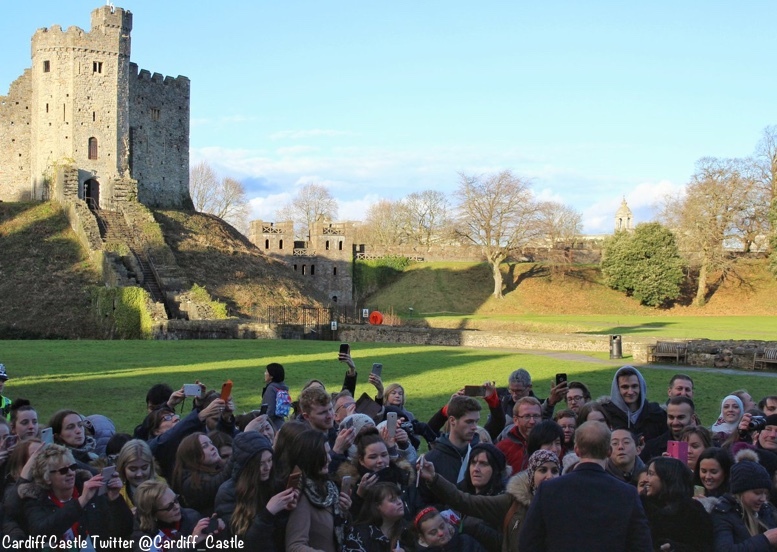 “As they went inside the castle for the celebration of Welsh culture, Prince Harry told his bride-to-be of his appreciation for Welsh singing. “You are only going to hear the best singing in Wales,” he said. 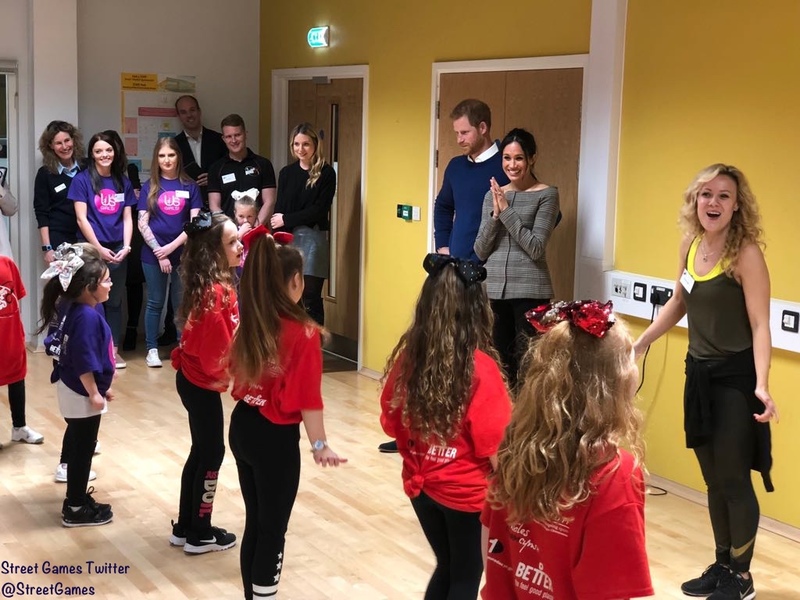 Meghan and Harry listened to a performance by Only Boys Aloud, a Welsh choir featuring boys aged 13 – 19. 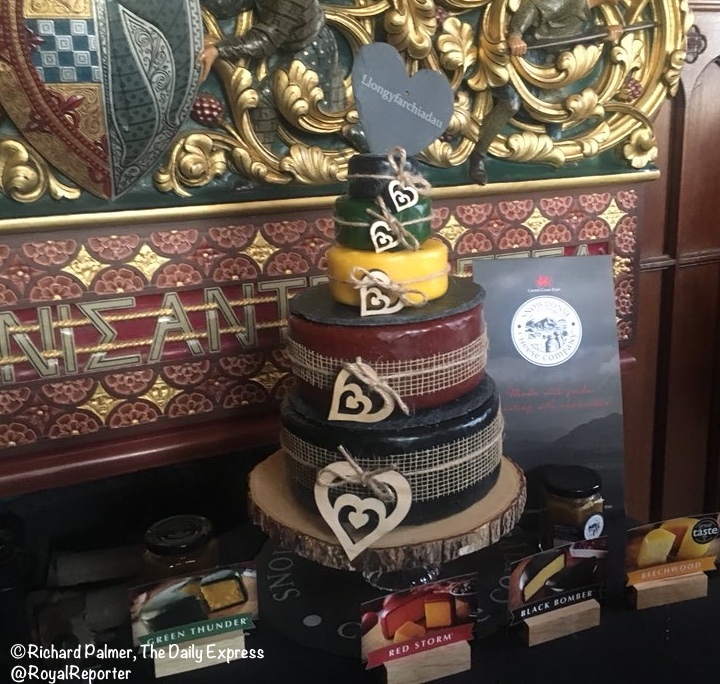 Meghan and Harry saw a mix of Welsh food products in a Taste of Wales exhibit. Among the items: a very creative wedding cake made entirely of local cheese, as Richard Palmer shared this photo. 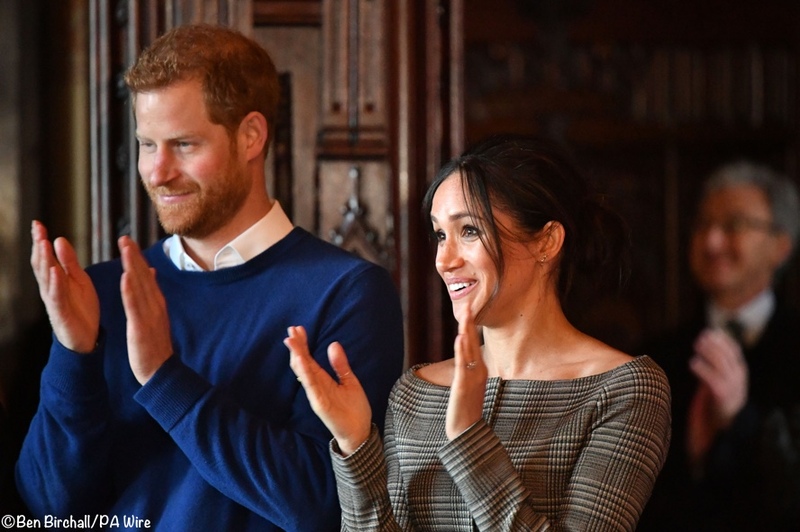 The couple were also treated to a wedding cake made from Welsh cheese, with Ms Markle exclaiming: “Oh my goodness, how sweet is that”. 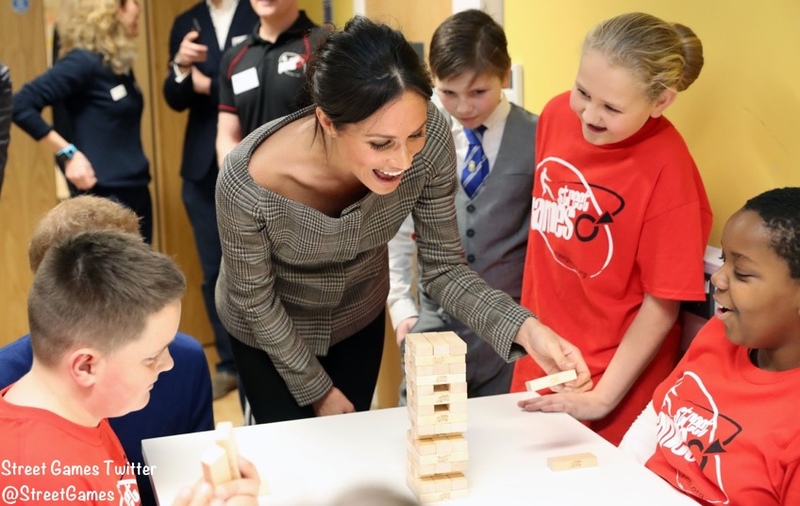 Both Ms Markle and Harry tasted small pieces of the mature cheddar that made up part of the five-tier cake, which she described as “really delicious”. I believe in this picture they are meeting some of the athletes in attendance. The second stop today was at the Starhub Community Centre, a local rec center. Jessica Walford of Wales Online posted a photo of the couple as they arrived. 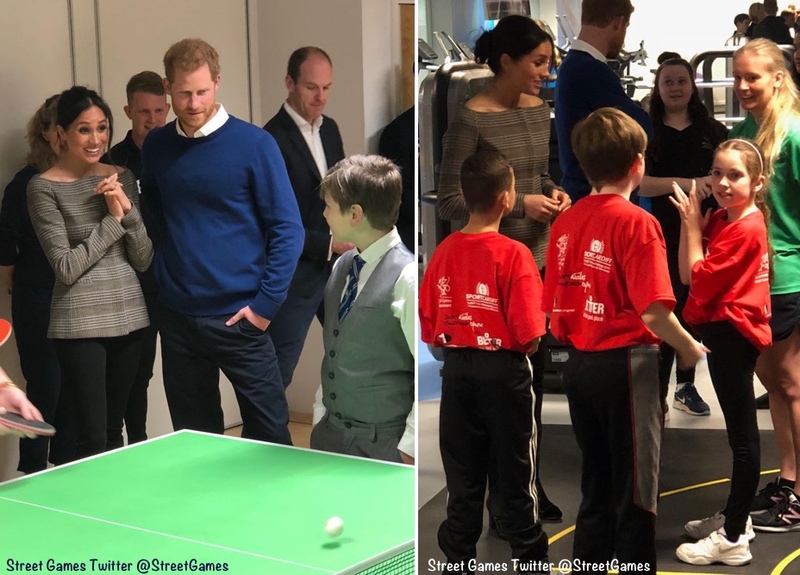 Meghan and Harry were at the Centre to see the work of StreetGames Network, a charity Harry has worked with previously that helps bring sports to disadvantaged young people. They spoke with StreetGames staff and volunteers. The couple watched some table tennis and spoke with many of the youngsters at the center. ET spoke with several staff members at Star Hub immediately following the highly anticipated visit, and it was clear that it was a success. 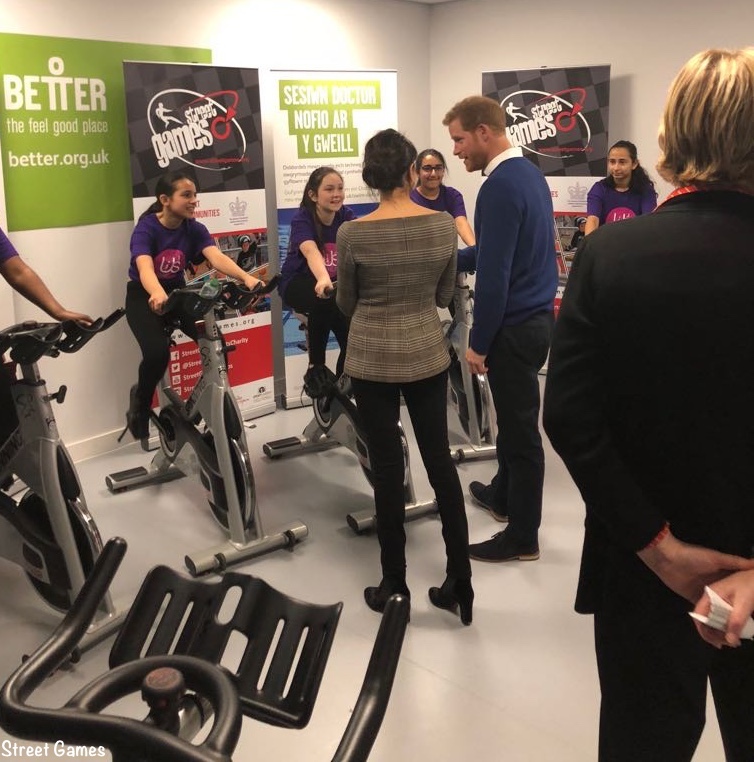 Meghan and Harry chatted with girls taking part in a spin class. Meghan tried her hand at Jenga. And they watched a street dance class. The participants are part of the UsGirls program, a StreetGames initiative that works to get young women from all backgrounds involved in sporting activities. 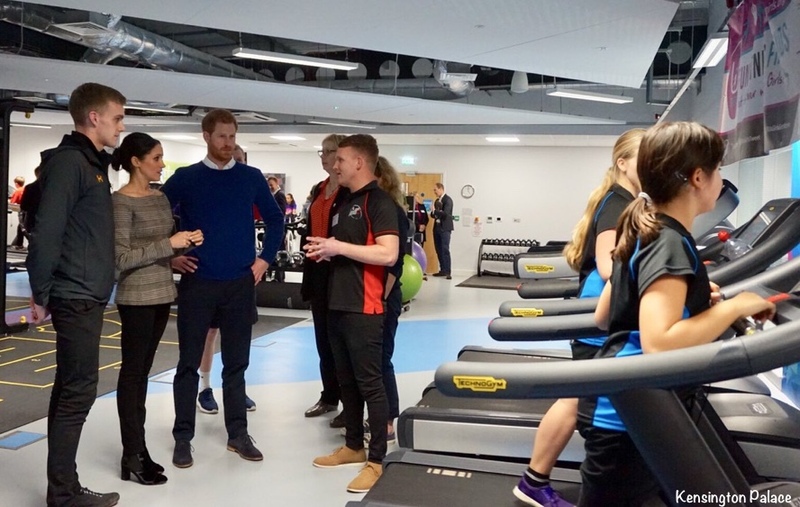 Meghan and Harry were in their element and appeared to enjoy every element of the day’s schedule. 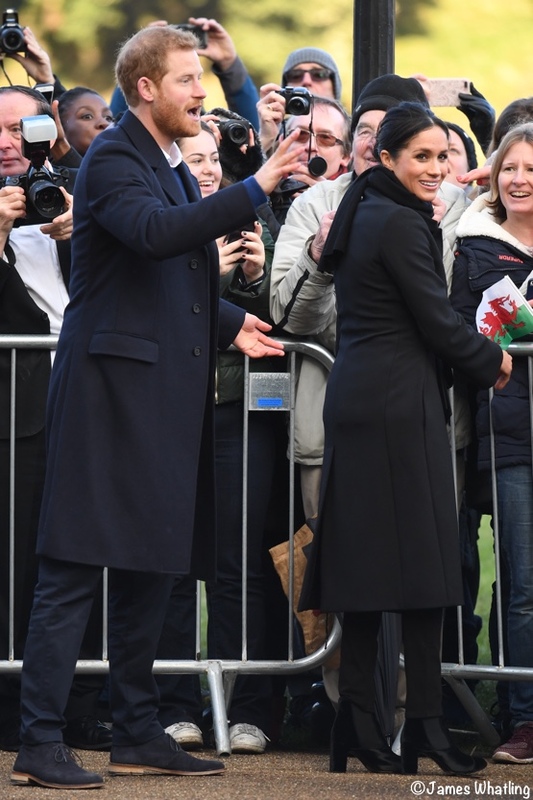 Now for what Meghan wore in Wales. Her coat is by British brand Stella McCartney. 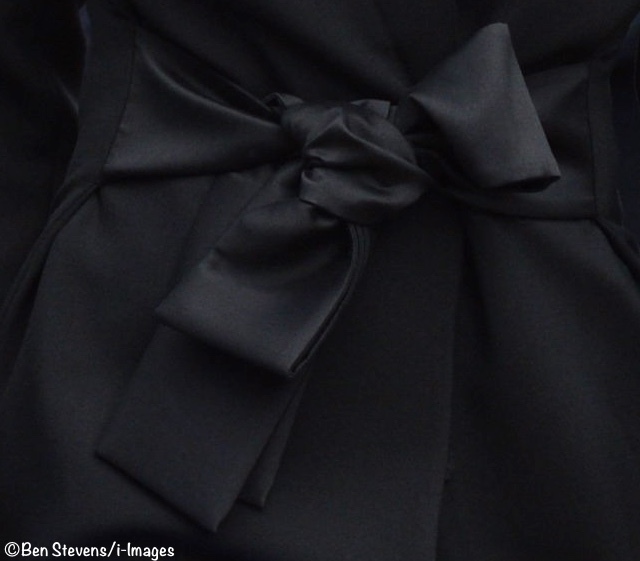 One of its most striking elements is the oversized tie in the front. We expected (both Susans!) to see Meghan wearing Stella McCartney; the brand’s sustainable fashion philosophy syncs well with Meghan’s outlook. Many thanks to Queen Rania’s Closet for her speedy ID of the coat style! Beneath the coat, Meghan wore a Theory jacket, an American label. Then one day the factory closed. It left town. But all that skill and know how remained. Without any way of showing the world what they could do. Today Meghan wore a pair of boots by Tabitha Simmons, another UK designer. 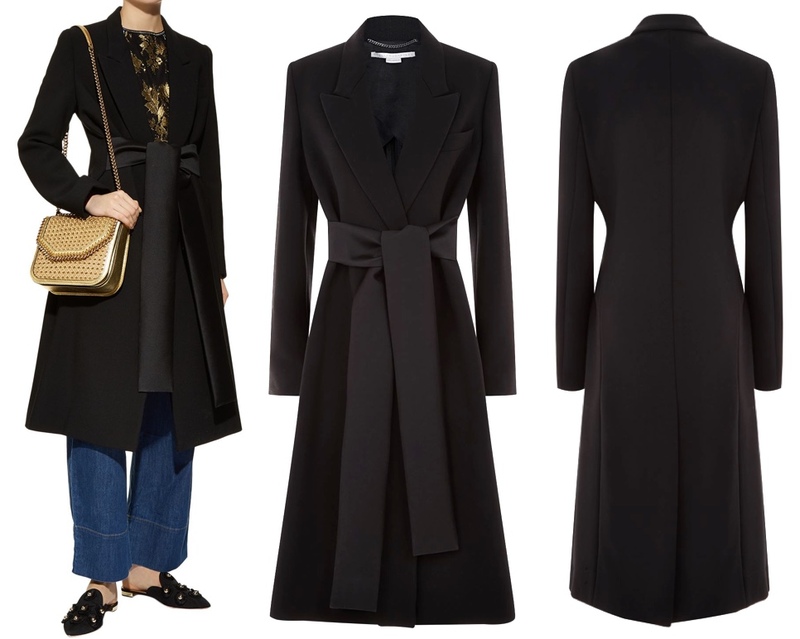 This is the ‘Kiki’ style ($708 at Farfetch) in black velvet. The ankle boots have a point toe, chunky block heel, elasticated side panels and a 4.5″ heel. 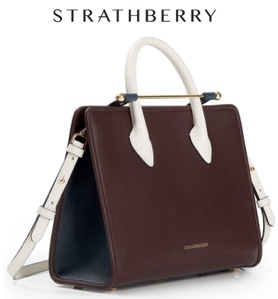 They are available at Browns ($682). 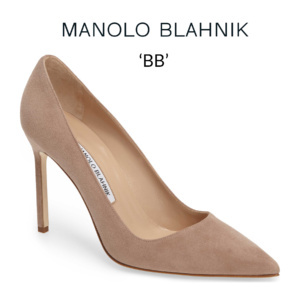 They are also on sale for $325 in a Size 7 at Moda Operandi. 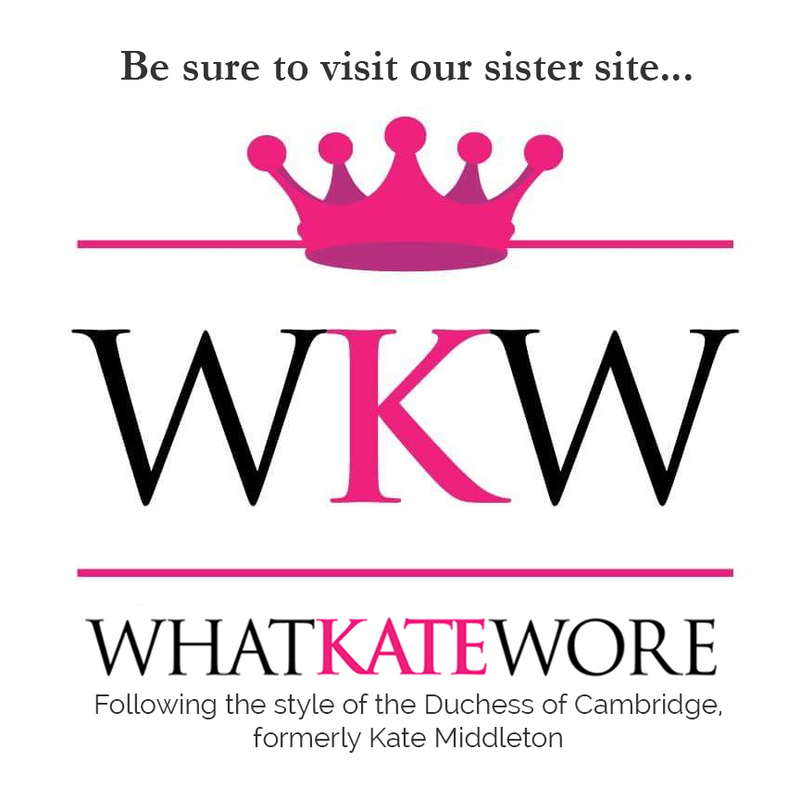 Meghan’s future sister-in-law, Kate, has worn a Tabitha Simmons style previously, but only twice. Thank you for this fab ID goes to Laura! 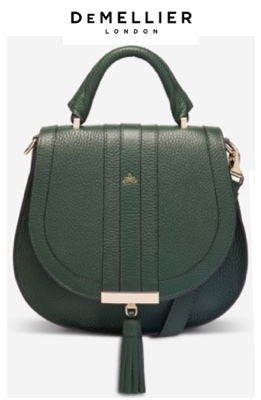 Meghan’s bag is the Mini Venice by DeMellier London ($395), another British company. The color is likely a nod to the green in the Welsh flag. 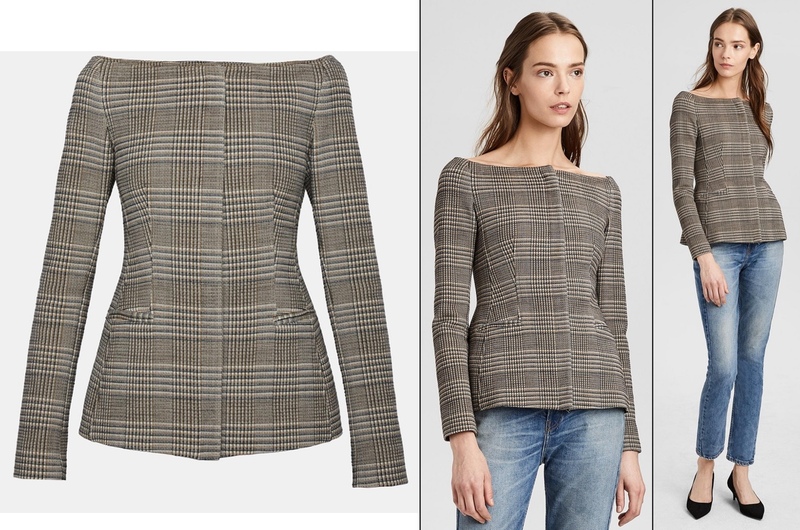 It is a good choice for Meghan, with structured, tailored pieces that work well with her style aesthetic. Additionally, DeMellier’s charitable endeavor A Bag, A Life, would hold appeal. More on that program from one of our WKW posts about the brand: “For every bag that is purchased Milli Millu pays for a set of lifesaving vaccines and treatments for a child in need. The company works with SOS Children’s Villages to make this happen.” Our thanks to Meghan’s Mirror for their bag ID. For jewelry, Meghan opted to wear two different earrings. On her left ear, she wore a Gabriela Artigas Triple Shooting Star Earring ($286), made of 10K gold. Gabriela Artigas is another boutique brand that would be attractive to Meghan. 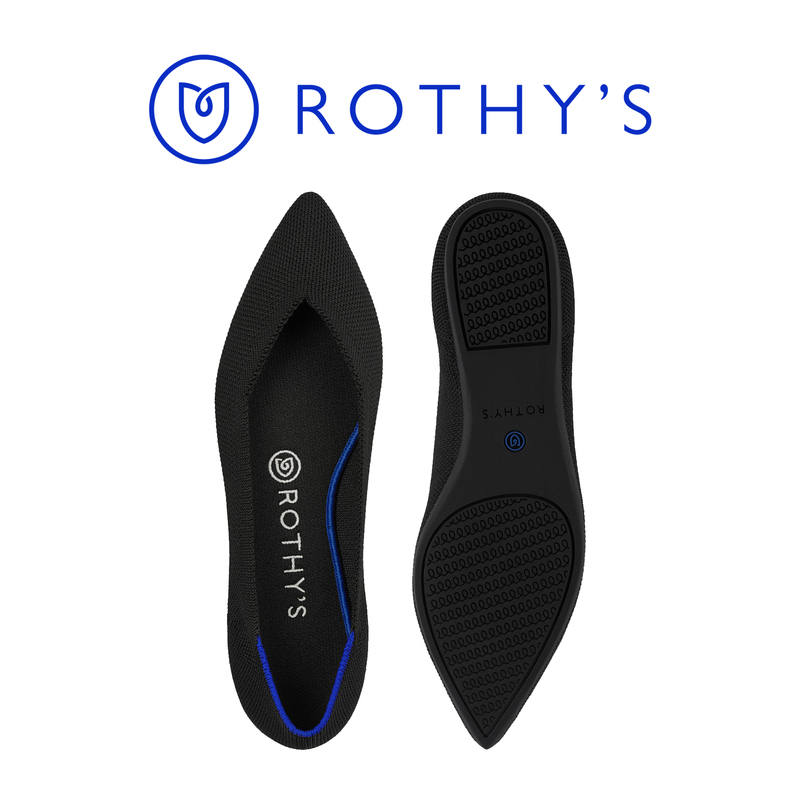 The company has been in business since 2003, created and managed by sisters Gabriela and Teresita Artigas; it is based in the US. 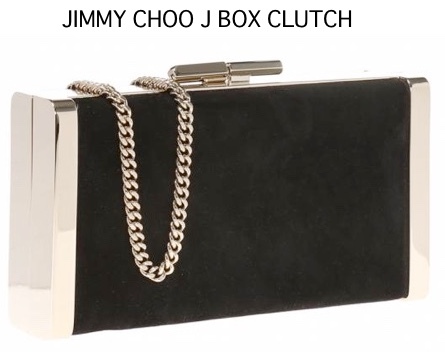 It is carried at Shopbop, at Azalea, and other retailers. 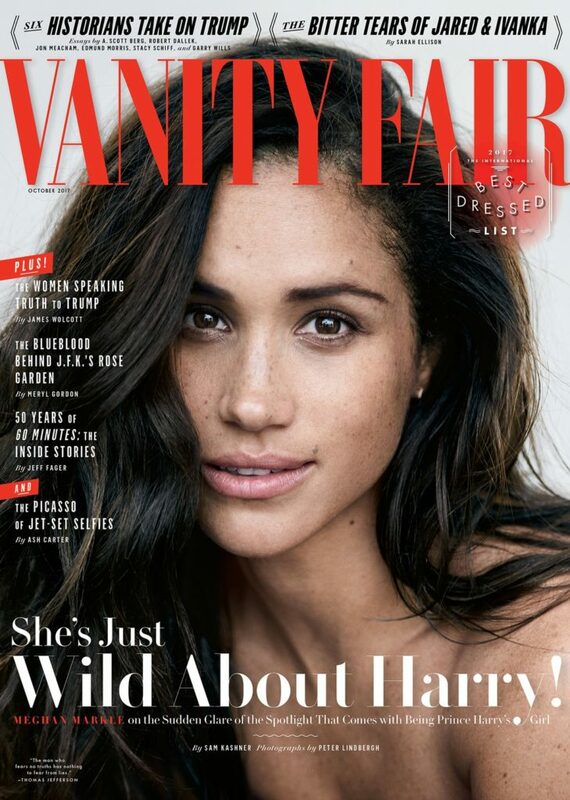 On her right ear, we see one of her previously worn Zofia Day Dash Ear Studs ($575); Meghan was seen in this style on the Vanity Fair cover. It was fun seeing Meghan mix things up this way with the two different earring styles. 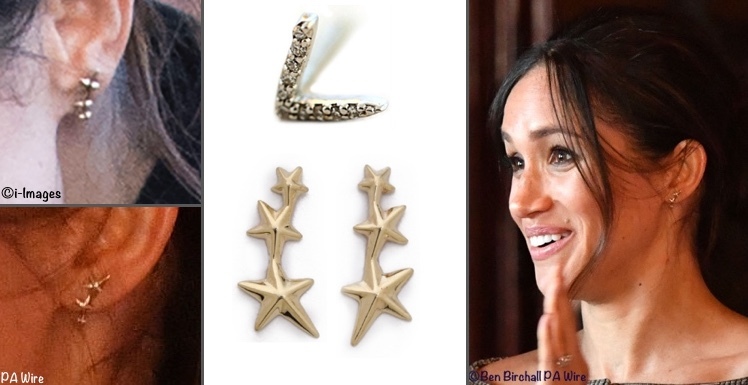 A Tip of the Tiara to Michelle of Perth Fashion for identifying the Shooting Star style, everyone was working from fairly small images to try and sort out who made the earring. It looked like Meghan also had on her Missoma stacking rings. 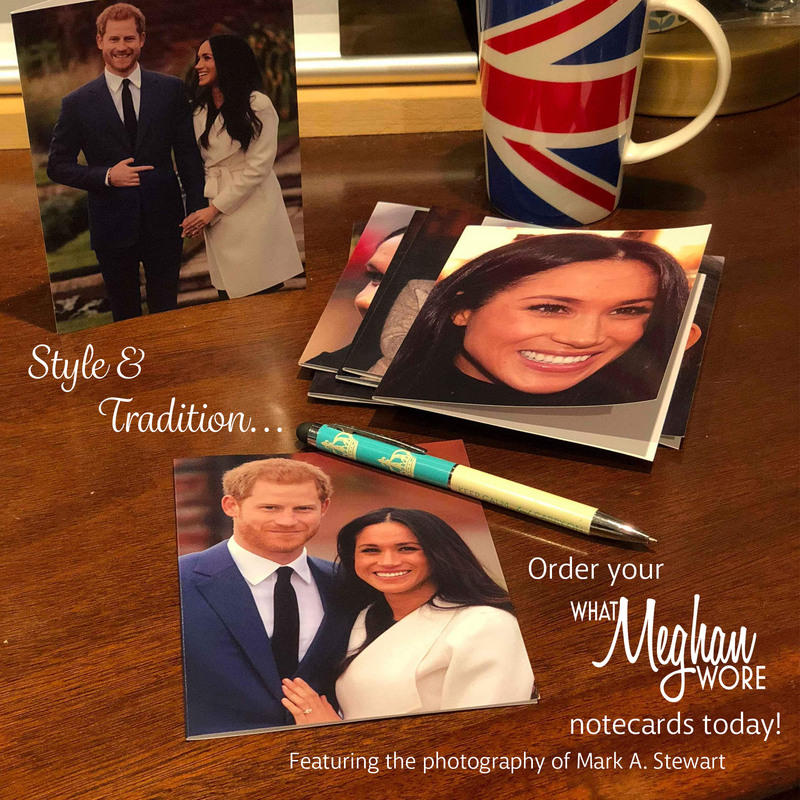 UPDATE FRIDAY JAN 19: If you look at the new photo we found, Meghan’s rings don’t match the photo precisely. It is the ring on her center finger that doesn’t match the Missoma styles we have previously seen Meghan wear. Meghan was actually wearing another piece by Birks. 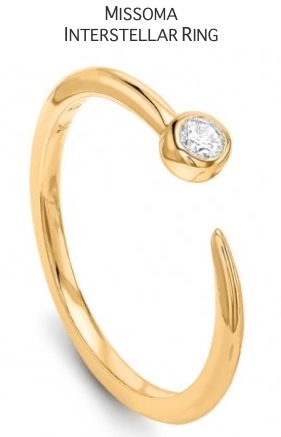 It is the jeweler’s Stackable Yellow Gold and Diamond Splash Ring ($1495). Thank you to Elizabeth of Meghan’s Fashion for identifying the ring! 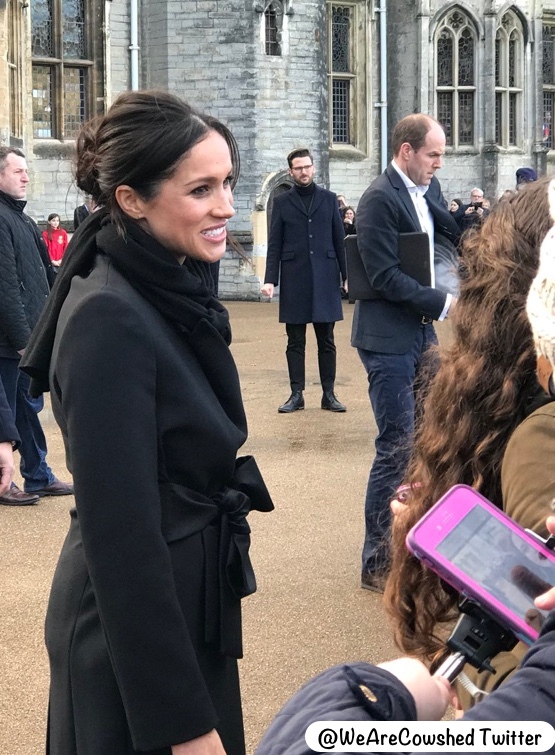 UPDATE FRIDAY JAN 19: We may have found the scarf Meghan wore yesterday. 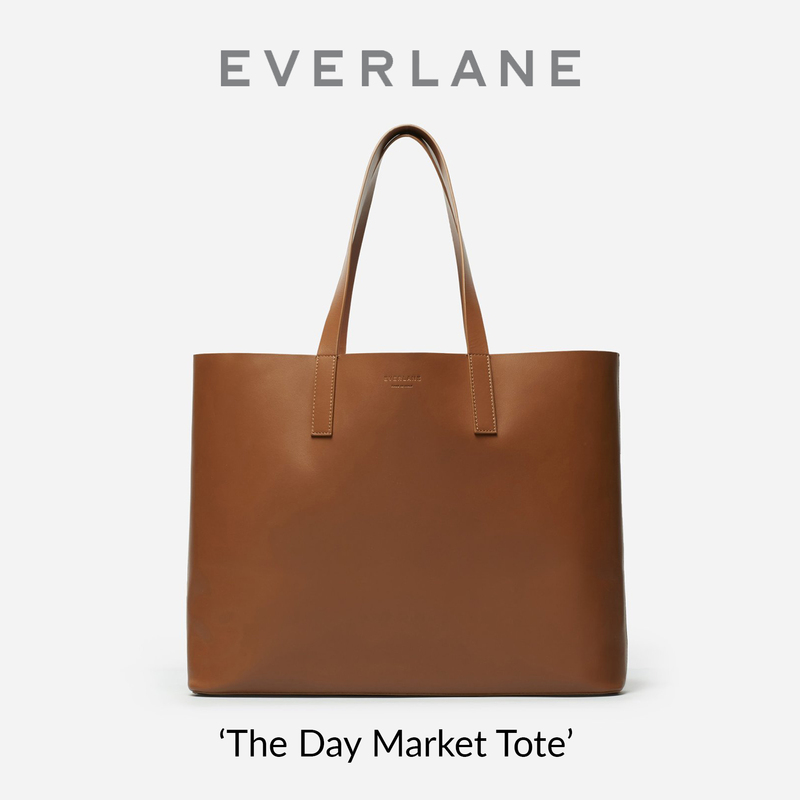 It’s very difficult to tell but looking at the photos, it could be Everlane’s Cashmere Scarf ($80). 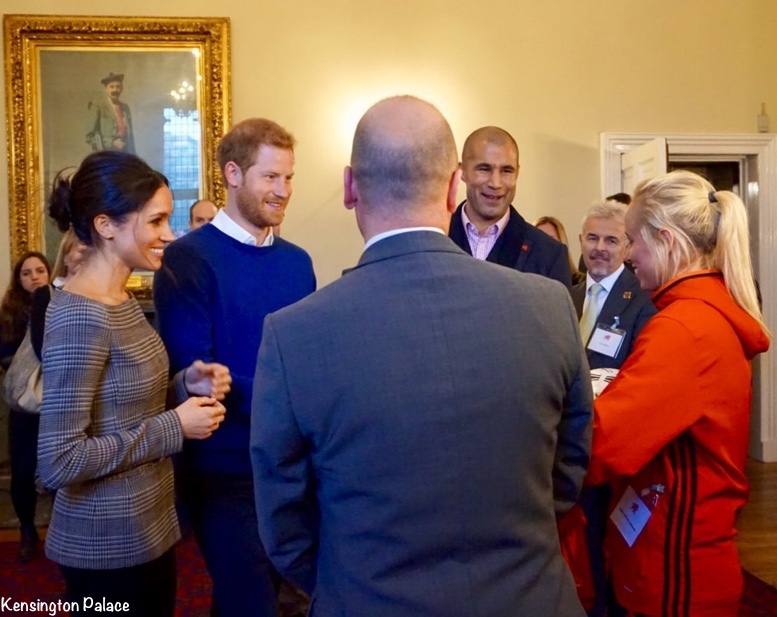 As on her previous engagement with Harry in Brixton, Meghan’s hair was in a messy bun. 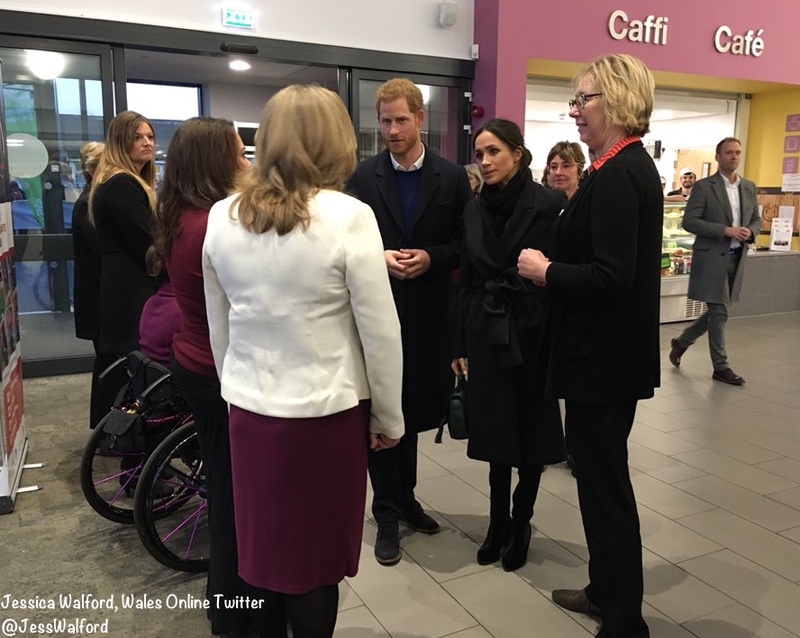 Meghan Markle showcased the power of fashion diplomacy and showcased her commitment to sustainable fashion during an official visit to Cardiff today. In her life before becoming engaged to Prince Harry, Markle was an activist for charitable causes and sustainability. Today’s look demonstrated her resolve to continue those passion projects in her new role. 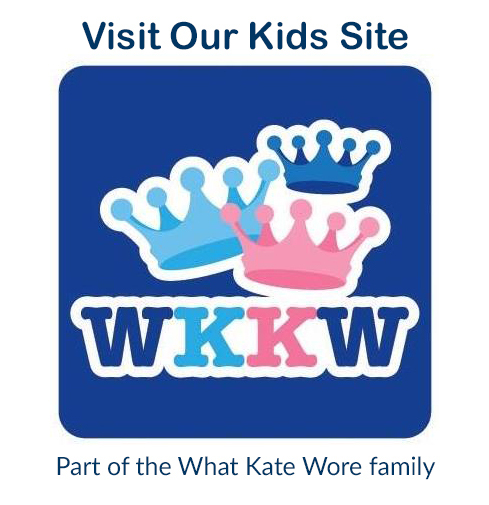 Our graphic showing what Meghan wore.